You’ve got into business school. When should you start thinking about an internship? Some MBA programs have begun to facilitate internship opportunities from the moment students are accepted, while others encourage students to consider their ideal internship scenario before the first semester even begins. Internships are especially important for ‘Career Switchers’—students who decide to embark on the MBA path after years of employment in another industry. Internships are a saving grace for ‘Switchers’ seeking to test the waters in an entirely new field or to gain experience to round out their skillsets. MIT Sloan students, for instance, have an average of five years' work experience before they opt to pursue an MBA, according to the school’s annual employment report. While summer internships create an additional three months of work during an already jam-packed two-year MBA program, the investment tends to expedite students’ job searches in the long-term. This is why summer internships are growing on a global scale; a recent GMAC survey shows that 59% of companies have actively increased the number of internships offered to MBA students. While it’s true that not all MBA internships are paid, a majority of MBA internships offer competitive salaries—on average, $6,600 to $10,600 per month—that vary based on the industry, although consulting firms tend to be the most generous. Not a bad way to subsidize the high price-tag of an MBA program. For some, it’s difficult to see a downside to summer internships; certain MBA programs have even incorporated internships into their curricula instead of simply asking students to participate. “At Yale School of Management, all students do an internship or equivalent summer experience,” says Abigail Kies, assistant dean of Yale SOM’s Career Development Office. "In 2017, 27% of our graduating class returned full time to their summer employers, and more had offers. Yale’s post-internship employment statistics are in line with national trends—three-quarters of companies that offer internships prefer to rely on former interns during the hiring process. Students’ likelihood of receiving a job offer after an internship depends on a number of factors, including but not limited to the degree of investment an MBA program has in its career development office; percentages of alumni at top US businesses; and whatever the current state of the economy might be. 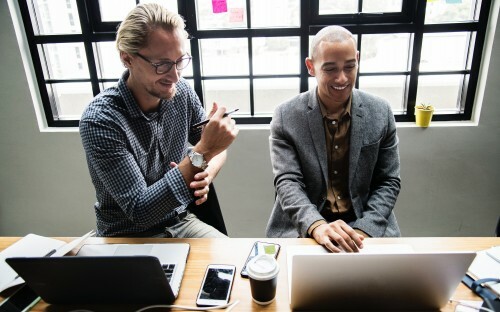 As tech is the fastest growing industry for MBA internship opportunities, a student's tech-savviness has also begun to play an increasingly significant role in the job offers they receive after an internship. Jean Ann notes that when it comes to employment opportunities, MIT Sloan students—not surprisingly—have their pick of the litter. “In recent years, approximately 35-to-40% of students accept a full-time offer resulting from their internship," she says. According to the school’s annual employment report, 75.7% of those students are hired during school-facilitated activities made possible by the MIT Sloan Career Development office, whose goal is to help students ‘translate vision into action’. In addition to the standard career fairs, the Career Development office offers an exclusive online list of job postings from relevant companies, lectures, mixers, and a recruiting calendar that serves as a weekly guide to recruitment opportunities. Students have the opportunity to engage with professionals from the Parker Career Management Center, as well as peruse recent alumni profiles and top hiring firms, with the understanding that the degree should accelerate a student’s career trajectory. What do these opportunities and trends mean for MBA students today? Simply put: internships are the most direct path for many MBA students to connect with the company of their dreams. “Internship choices are becoming more about long-term goals rather than exploration, learning, and skill-building,” Abigail concludes.